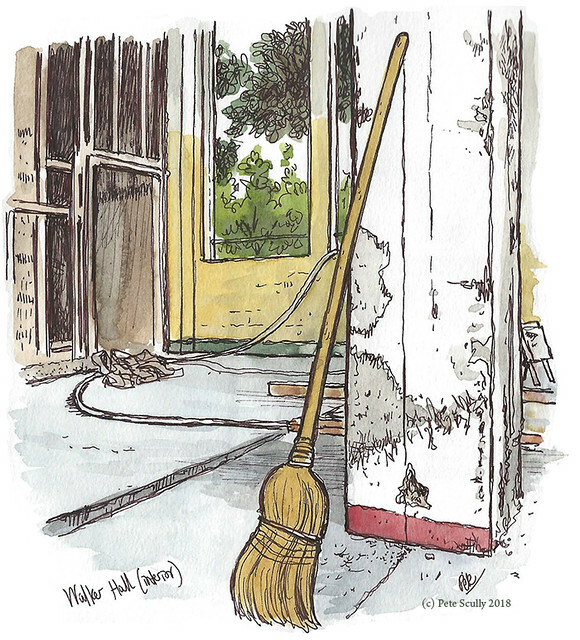 As you may know I have been sketching the ongoing reconstruction/renovation of Walker Hall, the big old building in the middle of the UC Davis campus that is being transformed into the Graduate Center. 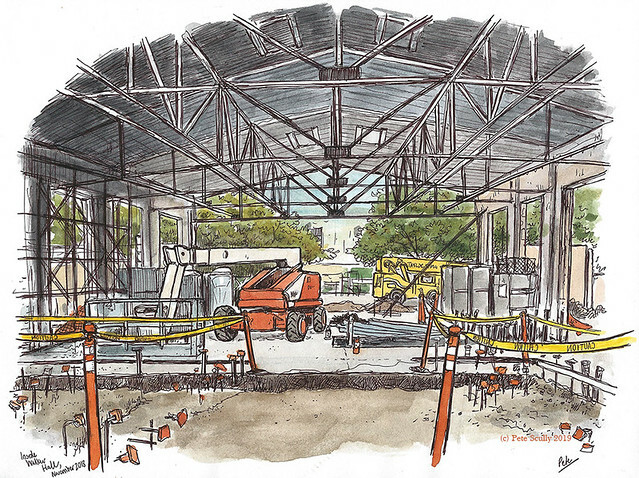 It’s an interesting and exciting project that will provide the university with a dedicated hub for graduate students in a setting that retains the elements of a historical piece of UC Davis architecture with a refreshing modern upgrade. Phew that all sounds like a brochure for a condo complex. Never ever write like that again, Pete. 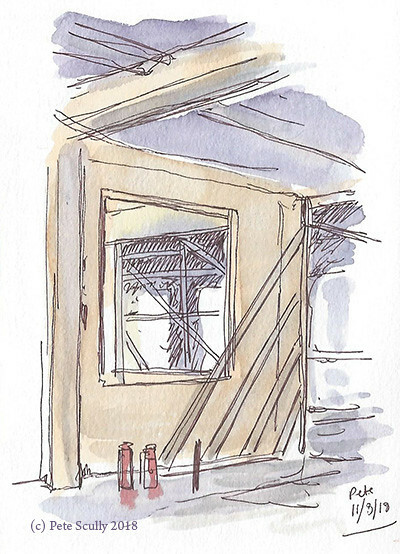 Anyway, there was a nice write-up about my documentation of this on the UC Davis Graduate Studies website, and back in November I was invited to go inside and actually sketch the site. “As long as I can get a photo of me sketching with a hard hat!” was my response. 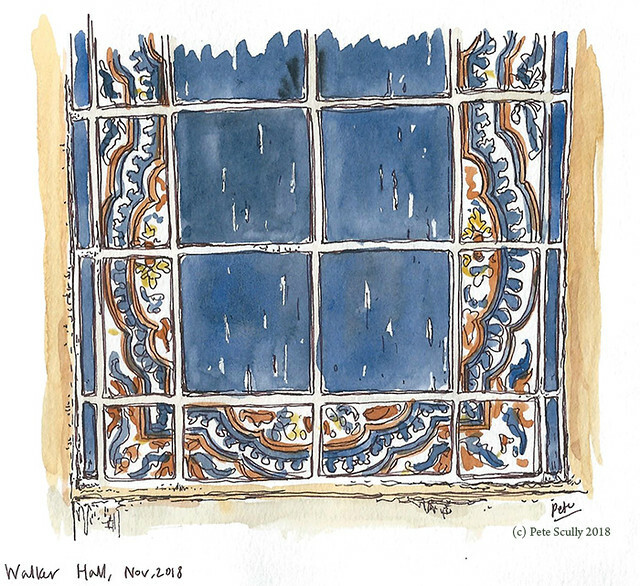 Urban Sketching cred you know. Of course the yellow vest has in the time since taken on slightly different undertones on the other side of the pond but it can be a handy tool. Years ago someone told me that they often wear a yellow vest when they go out filming on the streets for their art projects, so that nobody questions them, they look like they are from the council. 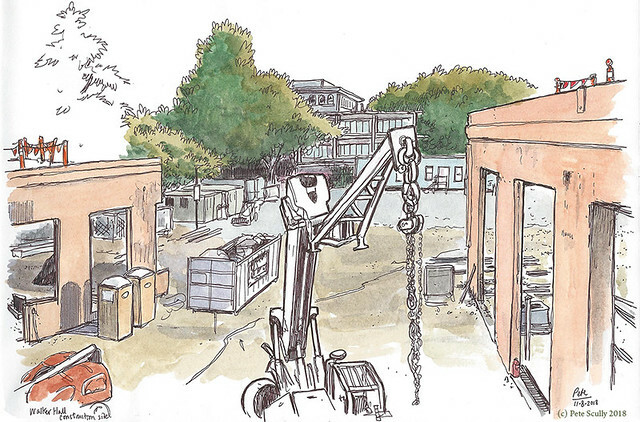 Well I’ve never done that, but it was nice to be officially kitted out by the management for sketching a building site, though I could only sketch after the builders were out of the way, and I wasn’t to jump over any big holes. I didn’t have long before the sun went down so I did as much as I could, and coloured in at home. Above, the view from the second floor overlooking two of the wings. Below, the sought-after picture of me in a hard-hat, sketching that very scene. The front of the building will remain mostly unchanged, though I imagine the tiles will be cleaned up a bit. The scene below was mostly drawn afterwards. It was the last thing I attempted to draw and I plotted out the perspective and where the intersecting lines would go, I drew the yellow tape barriers and the crane, and then I had to go. So I came back to it this weekend and finished it off. It’s funny drawing it from the outside so many times and then finally showing the inside. Finally, a sunset photo from the second floor. 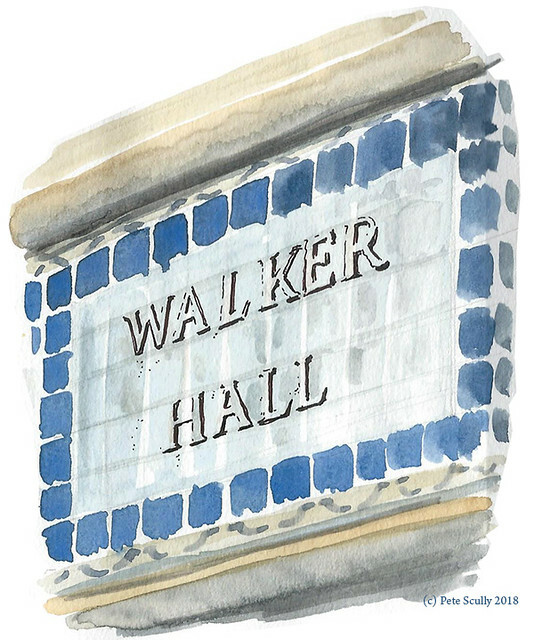 I have several more sketches of Walker Hall’s exterior that I have sketched since, but this seems like a good place to stop.